The world’s energy systems have become less affordable and are no more environmentally sustainable than they were five years ago. While access to energy has substantially improved, with less than one billion people now living without access to electricity, concerns over affordability and equity of energy transition are increasing. The Energy Transition Index (ETI) in the recently released World Economic Forum’s Fostering Effective Energy Transition report measures economies in two ways. Firstly, each economy is assessed for its energy “system performance”. This takes into account three criteria regarded as critical for transitioning to the future, namely: security and access, environmental sustainability and economic growth and development. The latter measures economic impact to households, industry and export revenues. Fig. 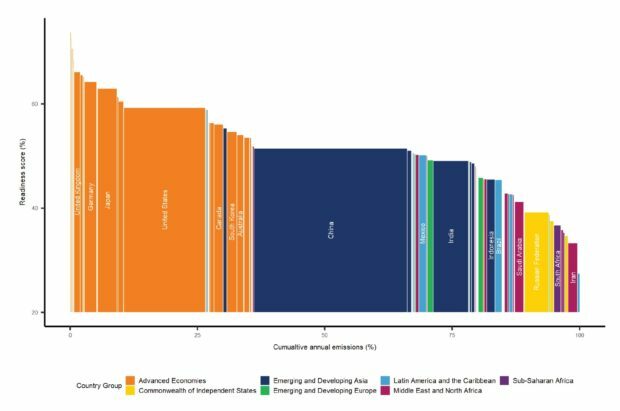 1: Transition readiness scores vs. annual emissions per country. “We need a future where energy is affordable, sustainable and accessible to all. Solid progress in bringing energy within the reach of more and more people is not enough to mask wider failures, which are already having an impact on our climate and on our societies. Urgent action is needed now to accelerate transition that works for business, consumers and our environment,” said Roberto Bocca, the head of Future of Energy and Materials, and a member of the executive committee of the World Economic Forum. Table 1: Top ten countries in the 2019 energy transition index. Results show that energy transition in the world’s largest emitters has stalled in the past year. While the United States (27) has made progress in reducing the use of coal in power generation, it slipped in the rankings by two places reflecting concerns about the affordability of energy to households, and regulatory uncertainty on environmental sustainability. Latin America and the Caribbean region have the highest average scores on environmental sustainability of all regions, primarily due to its significant hydroelectric capacity. However, large economies like Brazil (46) and Mexico (37) did not show improvements on the previous index, while Colombia (34) and Dominican Republic (78) moved up the rankings. Regional integration of electricity markets and infrastructure, electrification of mobility, along with increasing operational efficiency of energy infrastructure can help unlock further improvements. The post Energy transition in doubt as affordability, sustainability stall appeared first on EE Publishers.